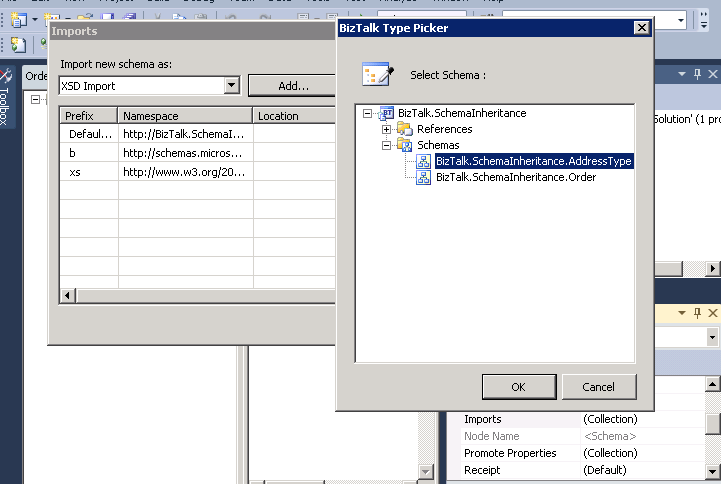 Frequently I find myself at clients explaining BizTalk best practices and one of the items I always try and push forward is proper schema inheritance practices. Much like object-oriented design, schema inheritance can help create a nice canonical domain model. However, there are always questions as to which type of inheritance to use. While these practices go beyond just BizTalk, I wanted to focus this on implementation within the BizTalk tools. Microsoft (and others) do put out documentation on this very subject but it doesn’t really go into any good examples of each type so I plan to plug that gap here. The first few sections go into some background and other practices … if you are just looking for examples and practices for the given types feel free to skip ahead. These all sound very similar in definition but there are some key usage scenarios for each in practice. When creating canonical schemas to be shared with multiple BizTalk applications they MUST be isolated in their own project/assembly. The first step in re-using other schemas is to define the reusable schema itself (obviously) but then to create actual schema types (ComplexType) out of the bits to re-use. This is the simple part: Simply select the “record” node which you want to re-use/share and set the DataStructureType property to the name you wish to use for the type. 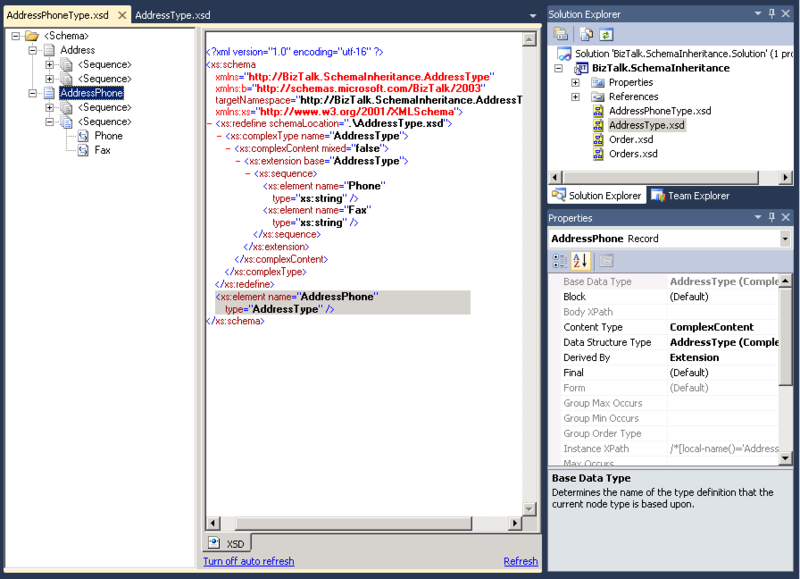 The following screen shot shows the data structure type property. It would be a good idea to define a naming standard/practice for these types … I generally use something like the node name plus the word type. For example if I were creating an Order schema I would create a complex type named simply: OrderType. 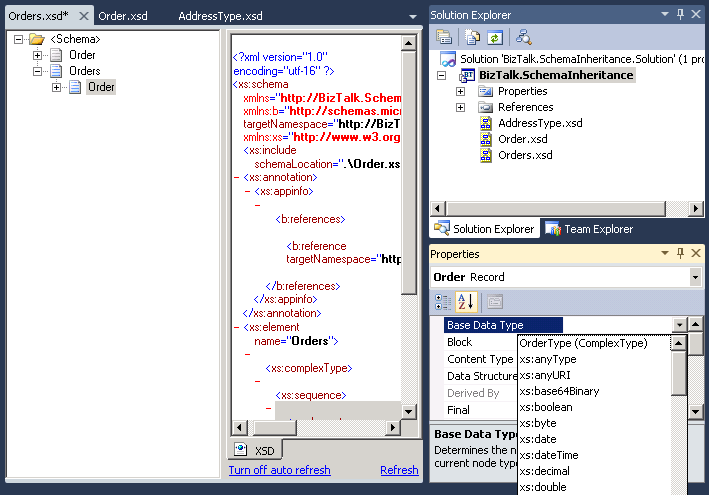 The following sections define a typical usage scenario for each type of schema inheritance. 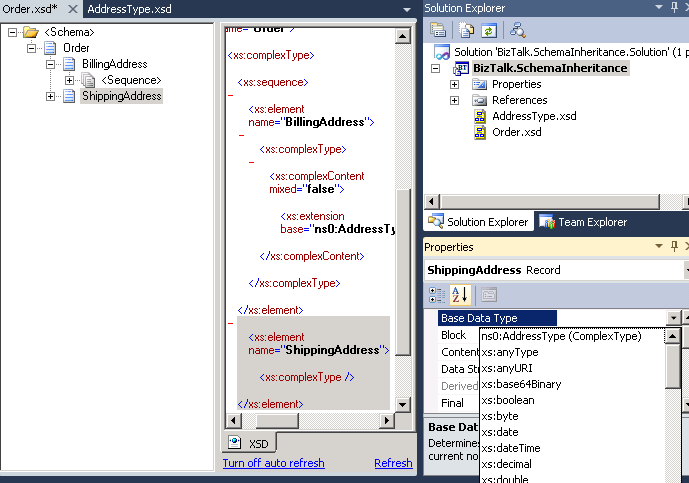 Create a schema which represents your address, and create a ComplexType out of it as in the above example. Next, create a couple of Child Records nodes for holding a Billing and a Shipping address. 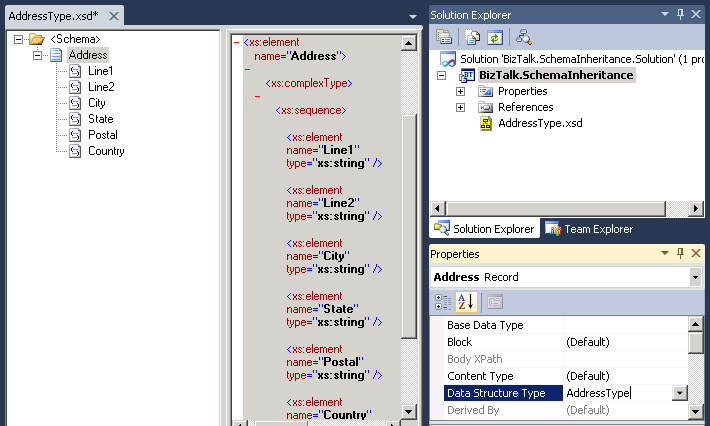 In the properties window for each record, set the Base Data Type to the complex type created above. Now as the address type is changed, it will be reflected in your Order schema as well. Another, perhaps more useful, example is adding additional context details to a schema. Take, for example, the Order Schema created above. If you wanted to add additional process context items you could wrap the order schema into another schema (call it: MyProcessOrder) where a child record node represents the Order and additional items are added as sibling nodes. Using this method isolates your Order schema as the “Order entity” without poluting it with non-Order related attributes. XSD Includes are slightly different from Imports in that the target namespaces of the schema and the included schema must match. The primary use case I have used here is when creating envelope schemas used for debatching. Continuing the above Order example, convert the Order schema to a ComplexType (using the Data Structure Type node) so it can be included in another schema. The XSD Redefine is probalby the least uses type of schema reuse for me as I genreally find myself using it to “hack” around another schema or trying to over-simplify something … and actually making it more cumbersome in the end. Now, add a new Sequence Group to the new child record and customize! Now you can change the Address schema without affecting other “consumers” of it. Very useful if you want to embrace the re-usability of the Address type but not break aa bunch of other schemas which inherit it as well. 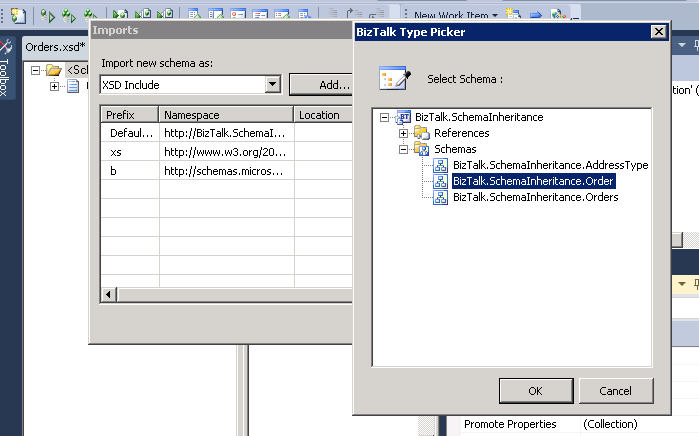 Now, with the above examples BizTalk developers can embrace re-usability in their BizTalk schemas along with other best practices! Good article, very much helpful..